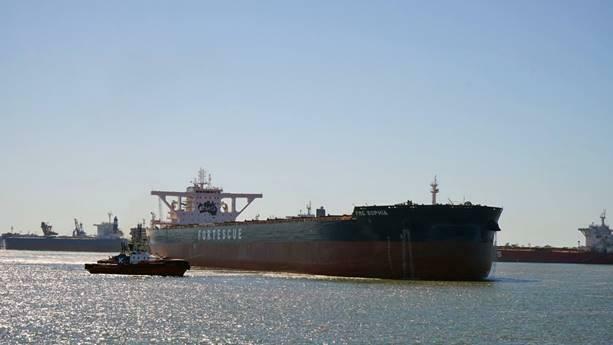 Fortescue Metals Group’s (Fortescue) third ore carrier ‘FMG Sophia’ has been welcomed into Port Hedland by Fortescue Founder and Chairman Mr Andrew Forrest, following the recent deliveries of FMG Nicola and FMG Grace. Joined by Nicola Forrest, Fortescue team members and Vocational Training and Employment Centre (VTEC) trainees at a ceremony on board the ship, Mr Forrest said he was proud to welcome the third of the Fortescue class ore carriers, named after his daughter Sophia. “I am delighted that we can celebrate the arrival of FMG Sophia with our latest group of trainees, recognising that the VTEC program and the ore carrier fleet are outstanding examples of Fortescue’s unique culture,” Mr Forrest said. “These ideas only become a reality thanks to the hard work of everyone at Fortescue. It’s terrific to have the opportunity to come together and celebrate these important milestones,” Mr Forrest said. FMG Sophia is the third of four Fortescue class ore carriers from the Yangzijiang Shipyard in China. A further four ore carriers are being built at Guangzhou Shipyard International, with the delivery of the final vessel expected in mid-2018. The ships are designed to maximise the tonnage per ship, improve loading rates, and enable the safe manoeuvring within the port and the channel. When fully operational, the fleet will provide approximately 12 per cent of Fortescue’s total shipping requirements.